Rafale Deal - Congress' 'Chowkidar Chor' jibe punctured? HomeScamRafale Deal - Congress' 'Chowkidar Chor' jibe punctured? A 3 judge Supreme Court panel has dismissed the Rafale allegations stating that no instance of commercial parisanship was found in its deliberations. It further added that minor variants in contract clauses and prices should not amount to setting aside of the deal. By this, the SC has effectively dismissed all the petitions seeking a court-monitored investigation into the Rafale deal. The verdict is seen as a shot in the arm for the BJP and a setback to Congress which had been using the 'Chowkidar Chor' jibe as an election plank. A french investigative journal has quoted former President of France François Hollande as saying that Indian government proposed Anil Ambani led Reliance Defence as Dassault's India partner for the multi crore Rafale deal. This flies in the face of the stance which was adopted by GoI that Reliance was chosen by Rafale with neither government having a role in it. Hollande's statement comes as he was cornered into clarifying his role in the deal as Anil Ambani's Reliance Entertainment had entered into a deal to produce a film with Hollande's partner and actor Julie Gayet two days before the deal was inked. Hollande said the French government had no role in the deal as India had proposed Anil Ambani's Reliance Defence as the partner. It is also worth noting that Anil Ambani bought Pipav Shipyard, a warship manufacturer set up in 2005 and reeling under Rs. 7000 crore debt in 2015, in March 2015, paying 10% above the price quoted by all other competitiors, with money on the table. The company was then listed under Ministry of corporate affairs, with a stated capital of Rs 5,00,000, on March 28, mere 12 days before Modi visited France and finalised the Rafale deal on April 10, 2015. If Hollande's statements are proven true, the BJP led government will have a tough time explaining why it recomended this particularly dubious venture, with zero experience in aircraft manufacturing, over other established players in the defence sector, notably HAL, whose former head T. S. Raju has said on record that HAL was capable of building the Rafale jets in India. The twin-engine Rafale combat jet from Dassault, the French aircraft builder and integrator, is a multi-role fighter designed for air-to-air and air-to-ground warfare. It is nuclear-capable and its on-board Electronic Warfare systems are capable of performing reconnaissance and radar jamming roles. The aircraft is even fitted with an on-board oxygen generation system which suppresses the need for liquid oxygen re-filling or ground support for oxygen production. The Indian Air Force (IAF) has been in need of around 200 Medium Multi-Role Combat Aircrafts since 2001. The UPA government approved the demand in 2007 and initiated the bidding procedure. Many companies responded and finally, Dassault won the bidding in 2012 to provide 126 Rafales at ₹54,000 crore-18 jets to be provided ready-to-fly and the remnant to be made in India by HAL (Hindustan Aeronautics Limited) in Bengaluru. However, the governance changed hands in May 2014 before the deal could be finalised, and the Request for Proposal (RFP) for the 126 aircrafts was cancelled. The new BJP government effectively scrapped the UPA deal and in April 2015, Prime Minister Narendra Modi announced a new deal by which India would buy 36 Rafale fighter jets off-the-shelf from Dassault. On September 23, 2016, India signed an inter-governmental agreement with France for the same, dubbed as "Rafale deal". As per the deal, India will also get spares and weaponry, including the Meteor missile, considered to have a place among the most advanced missiles in the world. Soon after the deal was declared, the Congress accused the ruling BJP of non-transparency, nepotism and kickbacks in the multi-billion dollar deal and called it "one of the biggest failures" of the 'Make-in-India' programme. The BJP government on its part claims that the current deal is better than the deal negotiated by the previous UPA government with reported savings up to ₹14,000 crore. A cost breakdown of the deal in the original bid under UPA and in the bid under NDA, however, is not in the public domain. The delivery of the Rafale jets is scheduled to begin from September 2019 with 15% of the cost paid in advance and 50% of the total cost to be spent in India by Dassault as per the offset clause, which is standard practice in all defence contracts worth more than ₹300 crore in India. On October 3, 2016, Dassault and Anil Ambani's Reliance Aerospace announced a joint venture called Dassault Reliance Aerospace with plans to set up a facility spread over 100 acres in Nagpur to create a complete supply chain for the Rafale fighter jets in India. The Dassault-Ambani venture would be a key player in the execution of offset obligations, with the remaining being shared by Bharat Electronics, Bharat Dynamics, and other defence contractors. 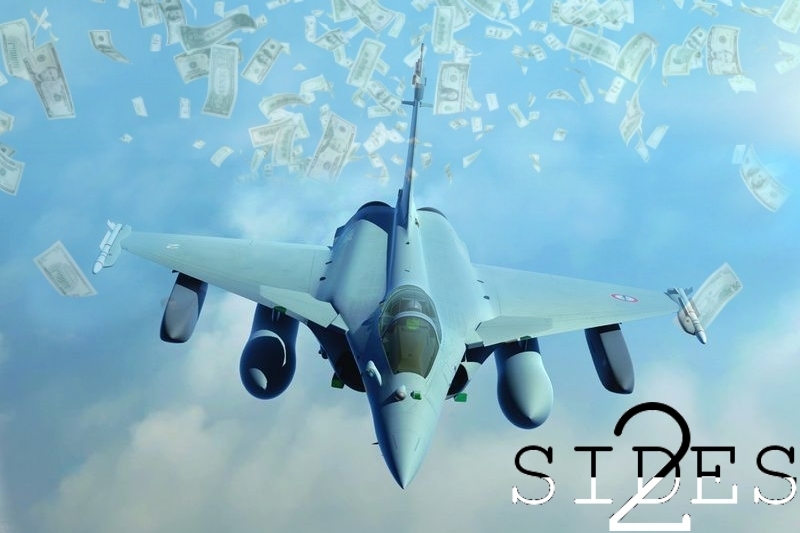 Political warfare over the Rafale deal began with the Congress party in the opposition accusing the Modi government of causing "insurmountable loss" of taxpayers' money by signing the new deal estimated at ₹58,000 crore. It is alleged that the cost of each aircraft is now more than three times what the previous UPA government had negotiated for in the previous deal. Defense Minister Nirmala Sitharaman claimed at a press conference that the current deal was in actuality much more beneficial to India than the previous one.However, a detailed cost comparison of the two deals has not been forthcoming from the government. The DM told the Parliament that the details of the deal with France for the Rafale fighter jets could not be disclosed as per the inter-governmental agreement as it is "classified information". Officials claim that due to the confidentiality clause in security deals, the buyer and seller are barred from talking about the pricing, thereby making it impossible for the government to reveal any such detail about the defence deals. The government states that the previous UPA government under Defense Minister, A K Antony too, had kept defence documents classified. However, Mr Rahul Gandhi tweeted "3 Parliamentary replies by the UPA with full transparency on pricing", sharing the UPA government’s reply over the deal for the acquisition of the Russian aircraft carrier Admiral Gorshkov, thereby challenging the government’s claims to secrecy. It has also been alleged that the PM single-handedly took the decision for the Rafale deal without even getting a formal nod from the cabinet. The then Defence Minister Manohar Parrikar himself wasn’t aware of the deal even as close as 48 hours before the announcement. Even BJP's own Subramanian Swamy, often considered a loose cannon, had publicly spoken against the deal and written a letter to the PM to stop it from happening. The Congress also claims that the Anil Ambani-led Reliance Defence Limited, with limited experience in the defence sector, has been unfairly picked to be the French firm's Indian partner. Terming the deal to be a sign of increasing crony capitalism, critics are accusing the government of favouring an industrialist friend. Congress President Rahul Gandhi had accused Prime Minister Modi of tweaking the agreement for the benefit of one particular business house. The Congress alleges a Modi-Ambani nexus, citing the instance where Modi's image was used in the ads and promotions of the Ambani-owned mobile network, Jio. When Dassault first entered the bid under the UPA, it had no leverage and much to lose if it didn’t get the bid. Dassault was desperate: its reputation of being non-transparent in its business (rated worst – F Band by Transparency International) wasn’t helping it much and Dassault’s CEO himself was mired in charges of financial irregularities. The Modi government's scrapping of the deal in 2015 came at a most unfortunate time and sank a decade worth of negotiations. But the Dassault-Ambani partnership changed everything, and PM Modi quickly finalised the deal for 36 aircrafts at almost ₹4,000 crore more than what the UPA had negotiated for 126 aircrafts. The government claims that various upgrades justify the 300% jump in the price per jet. This is incredulous. Even the two most touted features - the Meteor Missile integration and Helmet Mounted Display System (HDMS) - cannot cost more than ₹15 crore and ₹3 crore per jet respectively. The public sector aerospace and defence organisation HAL, which has made more planes that have flown and won our wars than Ambani ever has, has been left high and dry in the new deal. In the original UPA deal, HAL would have been involved in acquiring the technology from Dassault and indigenously manufacturing 108 fighter jets. By opting for 36 off-the-shelf fighters, the government has thrown away a golden opportunity to add substance to its Make in India initiative, to create more jobs and to make India's defence sector less dependent on foreign imports and more self-sufficient. Thus, in short, the opposition claims that the BJP government has bought a lesser number of fighter planes at a higher cost and in the process, sacrificed a public sector enterprise at the altar of crony capitalism. This is precisely the reason why the government is hiding behind clauses of confidentiality and not publishing a cost comparison table between the two deals. A question then naturally arises - cui bono? Who benefits? The answer definitely does not seem to be the ordinary Indian taxpayer. Defence Minister Nirmala Sitharaman, Dassault Aeronautics and Anil Ambani led Reliance Defence Limited has dismissed all allegations against them, as baseless. The government has stated on record that the renegotiated deal was more transparent and better than the deal negotiated by the previous UPA government. The new deal includes a superior weapons package and logistical support, as opposed to the previous one. The Rafale jets for IAF as per the new deal will also have 13 India Specific Enhancement (ISE) capabilities which are not present in the Rafale aircrafts being operated by other countries. Thus each plane is practically being tailored for Indian conditions. Further, the deal is a G2G contract between the governments of India(represented by PM Narendra Modi) and France(represented by President François Hollande) with an Inter-Governmental Agreement(IGA) inked between the two. The present IGA was signed purely between two sovereign governments and no private individual, firm or entity was involved in the process from the Indian side. The procurement process also does not involve any Indian private party. The IAF is facing an acute shortcoming in defence preparedness. Ideally, IAF requires 42-plus squadrons to take on a two-front war. Currently, its ageing fleet has diminished to 33 squadrons and this could further dwindle down to around 25 by 2022. The IAF has been waiting for 16 years for a deal to bolster its squadrons. The G2G method of the NDA deal facilitates the cutting down of time required to deliver the jets to the Indian Air Force. As a result of this, the delivery according to the renegotiated deal would be in a time-frame that would be compatible with the operational requirements of IAF, and with a longer maintenance responsibility upon the vendor. The current Rafale deal does not entail manufacture and assembly of the fighters in India. All 36 aircrafts will be manufactured in France and delivered to India, fully configured. Hence, the question of having an Indian production partner does not arise. In other words, HAL has not been replaced by any other entity. On the other hand, the Rafale contract carries offset obligation equal to 50 percent of the deal value. As the onus for the fulfilment of offset obligation is entirely on the vendor, it was entirely Dassault’s prerogative to choose its Indian offset partners, and they chose Reliance. The joint venture Dassault Reliance Aerospace was formed after bilateral agreements between two private companies and the Indian government had no role to play in it. It is quite ridiculous to compare the two deals under the two different governments. Especially considering that the UPA government's "deal" was a nonstarter. Dassault Aviation was not willing to take the responsibility of quality control of the 108 aircraft manufactured in India by HAL. While Dassault provisioned for 3 crore man-hours for production of the aircraft in India, HAL's estimate was nearly 3 times higher, escalating costs manifold. This, among other reasons, had led to a deep freeze between the two parties and negotiations were left in limbo. Further, unlike as claimed otherwise by the opposition, there were no terms of technology transfer in the previous agreement. What was on offer to HAL was the Licence of Manufacturing technology for the jets. Under the current agreement, however, the offset obligations support provisions for transfer of sophisticated design technology which is meaningfully superior to the licensed manufacturing in the previous deal. Article 12 of the IGA under offset obligations also states that the French party will facilitate the implementation of 'Make In India' by the industrial supplier. The Dassault Reliance Aerospace facility in Nagpur is expected to generate 1,500 direct jobs in seven years, with projections that each direct job would create six indirect jobs for suppliers and sub-contractors. The project aims to indigenously manufacture 50 percent of all Rafale jet components. It is an accepted fact that major defence deals are an instrument of a nation’s foreign policy goals. They do not take place in isolation and are not negotiated purely in terms of commercial activities. The secrecy maintained in such deals is of no wonder either. Defense deals are carried out on the basis of preferential pricing and hence, not fixed. The sellers consider it disadvantageous to reveal the sweeteners or discounts offered because it reduces their bargaining power with future customers. Moreover, the price of engines or cost-per-piece of weaponry makes it easy to adjudge the deterrence and deep-strike capability of the assets, beating the very purpose of procuring advanced fighter jets. Demands for transparency obviously should not be carried to such ridiculous limits. The Congress is slinging mud with all its might at the Modi government, in the hope that some of it will stick. With the Rafale deal, they are also trying to aggravate and take advantage of the deeply rooted sense of distrust for high-value defence deals in the minds of the average Indian. Ironically enough, the seeds of this penchant for distrust were sown by none other than the UPA and its decades of scams and looting. By trying to coerce the government into releasing details of highly sensitive information, Mr Rahul Gandhi and the Congress are endangering India's national security for political brownie points. Now the AAPturds are also shouting. Some details like exact weapons etc cannot be disclosed.